Steam And Things is proud to show this short section of custom work carried out for our clientelle where we have produced the drawings and phototools from sketches supplied by them. 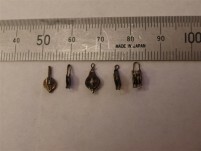 ALL these products are available from us. This is our custom etching and bespoke etching service. Further details (including presentation of information) are given with an official quotation. Please note,that custom etching or bespoke etching is akin to development work - every job is different! We do not offer a contract etching only service. This button takes you to a list of typical custom jobs done over recent time, whereas if you scroll down this page you can see a selection of pictures and short descriptions of some of them. 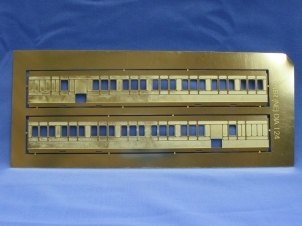 These are coach sides in 4mm scale for and LNER (NE) Composite / Van Coach DIA 124 52 ft to replace sides in a D&S kit. 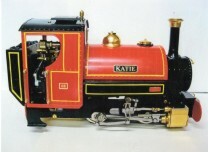 Apparently D&S do a range of kits, including a DIA 125 but not a 124. These paddle wheels, geared and ungeared are for a large scale model of Brunel's "Great Eastern". This will be a very large model - the wheels are 175mm (7") diameter and there are 384 teeth on the gear.